CREAF runs an annual programme of seminars that showcase the global research work in the field of ecological science both within and beyond our centre. ​Each seminar normally lasts 30-40 minutes with plenty of time afterwards for questions and discussion. Seminars are usually on Wednesday at 3 pm. 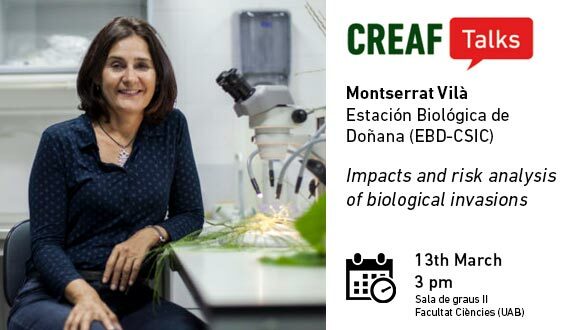 Montserrat Vilà, Estación Biológica de Doñana. "Impacts and risk analysis of biological invasions"
Biological invasions occur when species are introduced by humans beyond their natural dispersal ranges, establishing and spreading in a the region. Indeed, many introduced species are more competitive than native species, they might escape from natural enemies, and modify the environment. Some introduced species cause ecological impacts and can affect socioeconomic sectors such as forestry, agriculture or public health. I will present some synthesis work on the impacts of invasive plant species. From the management and policy perspective it is important to identify which invasive species are causing, or have the potential to cause, major impacts. I will present some risk assessment protocols we have developed, and discuss their applications. My research focuses on the ecology of biological invasions, especially in Mediterranean ecosystems including islands. In collaboration with a large international network of ecologists we conduct field experiments, extensive field surveys and the analysis of large datasets to improve our understanding on the ecology of non-native species, to develop risk analysis of invasions, and to mitigate their impacts. Main areas of study include landscape and environmental factors associated to invasions, biotic factors controlling non-native plant establishment and ecological and economic impacts of biological invasions. Our work contributes to quantify the ecological impacts of biological invasions on biodiversity and ecosystem functioning. We are committed to identify the most impacted habitats and the traits of non-native species conferring major changes in ecosystem services. With this information we develop Impact Risk Assessments for major invaders in Europe.